Rink Rover: Stop the Subbanity, Montreal! On Thursday, we learned that meth dealers in the Montreal area are huge Habs fans. On Friday, we learned that the Montreal Canadiens' management are huge fans of crack. How else can we explain their decision to go the distance with disgruntled defenceman P.K. Subban--having a showdown in what must have been an ugly arbitration hearing. How do we know it was ugly? 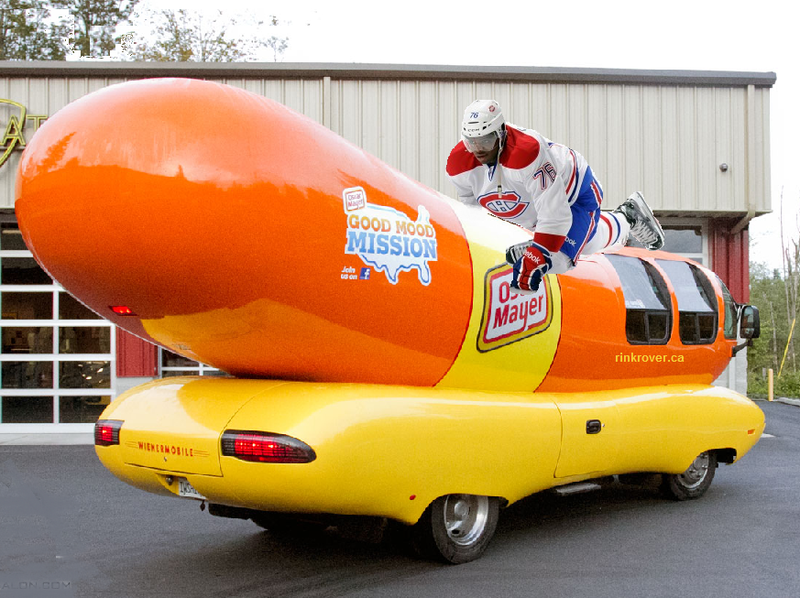 Subban's sound-bytes afterward seemed chastened, which means that he--a player considered by some to be more of a hot dog than the Oscar Mayer Wienermobile--was uncharacteristically subdued. I assume that this picture adorns the walls of all true Boston Bruins fans. How did things ever come to this? Of the 23 players who were scheduled for arbitration, Subban--undoubtedly the most talented of the group--was the only one to face the nastiness of the player-on-club hate-fest. I have no idea what exactly goes on in arbitration, from what I've read, the experience sounds worse than being trapped in a bunker and berated by a delusional Hitler as in Downfall. That isn't a great analogy because enduring the demise of the Third Reich through Downfall lasts just over 2-1/2 hours, whereas Subban's grueling defense of himself went on for 4. Somehow, despite taking numerous dirty hits during his so-called "off-season," Subban still managed to talk to reporters amicably afterward. Meanwhile, Marc Bergevin stole away without offering any comment, leaving his franchise defender to block shots on himself just as he did for the team all year. I get why Bergevin ducked questions; it'd be hard for anyone to defend offering Subban, the 2013 Norris Trophy winner, a one-year contract worth $5.25 million. That's Andrei-Markov money. Are the Habs trying to imply that they value Subban as much as they value Markov? Of course not, because it's actually Markov's annual cap hit that is in the same ballpark ice rink as what Subban's been offered. Markov's actual salary next season will be $7 million. The Habs want to sign Subban for a marginally lower cap hit than Markov's even though Subban is demonstrably superior to Markov in every way except the unenviable "cumulative seasons spent on LTIR" stat. In fairness, the Habs didn't likely expect Subban to accept the $5.25 million deal. Part of the negotiation process involves teams suggesting a number lower (and agents recommending a number higher) than what the RFA in question deserves. However, when a team insults a player by proposing substantially less than market value, they need to resolve the issue before it goes to arbitration. Otherwise, they're stuck with defending their offensive offer. Subban probably didn't feel too insulted by the initial offer as he knows that such tactics are part of the business of hockey. However, there's no way that he can't be offended after hearing Bergevin et al. anatomize every wart on his record in order to justify paying him far beneath his worth. What evidence could they possibly have provided to argue that Subban was a sub-$6 million player? In this 4-hour fiasco about nothing, Bergevin probably appeared Seinfeld-esque as he let minor issues ruin his relationship with a budding star. Perhaps he alleged that Subban is a notorious close-talker, or that he double dips at team banquets. Still, unless Subban absentmindedly urinated on the team's expensive couch, I can't see how management planned to nitpick their way into getting a cornerstone player at an obscenely discounted rate. We could use advanced stats to prove why Subban deserves more than the Habs are offering, but those metrics have received far too much press since the Leafs hired Kyle Dubas. Instead, let's use some good ole unpretentious, salt-of-the-earth intangibles. Here are three reasons why Subban is indispensable to the Habs. Subban is the face of the current Habs. That's no exaggeration. When you go onto the Habs website, you will see his face everywhere. The team is basically saying, "Price play Subban = Canadiens." If Subban is not the face of the franchise, he definitely shares the position of "alternate face" with Price. How did Bergevin account for this explicit indication of #76's importance to the club? Maybe he claimed that they put him next to promotional materials because his name is synonymous with giveaways. If so, the NHL should hire me to attend arbitrations just to punctuate bad jokes with rim-shots. Prior to the arbitration hearing, Subban proclaimed that he wants to be a "lifer" in Montreal. That aspiration does not extend just to his playing days. 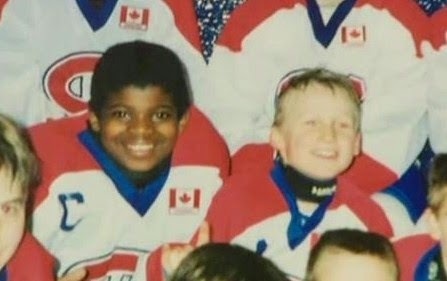 That's young Subban and young Steven Stamkos. While the latter seems as happy as any other kid, the former looks absolutely thrilled. Could that be because he grew up as a Habs fan and longed to play in a Montreal jersey? Unfortunately for him, Bergevin isn't going to let his best player's boyhood fantasy get in the way of abusing his RFA status to cut costs. This arbitration hearing will guarantee one or two more years of Subban's services at the possible expense of losing him in 2016, when he may gladly sign elsewhere to end a nightmare that started as a dream come true. Wow, point number 2 sounds bitter, eh? Let's lighten things up by talking about Subban's commitment to hard-nosed play. His on-ice tenacity and organ-rupturing hits are well documented on youtube. However, Subban's just as fearless off the ice. For instance, check out this gif of him going into the dirty areas of post-game interviews (namely, Pierre McGuire's head--a.k.a. "the pleasure dome"). This kind of commitment to forechecking (or foreplaying?) cannot be quantified using charts and graphs. Hopefully this blog post will soon become moot (after reaching 12 trillion hits!) because Subban will sign a long-term contract with the Habs. Since Subban's agent doesn't expect to work out an extension before the arbiter decides the case, it's on the Habs' management to win him back. So, Marc Bergevin, if you're reading this, stop the Subbanity and pay your most valuable RFA what he deserves. You might be able to win him back if you grab a ghettoblaster and head to Subban's hotel right now. You'll probably need to play something more potent than Peter Gabriel's "In Your Eyes." At this point, I'm not sure if blasting Air Supply or Lionel Richie will work, but it's worth a shot. I'm not making this plea for Bergevin's benefit, but for the sake of Subban, who has always struck me as an outstanding athlete. Also, I'm worried about what will happen to Canada if Subban signs elsewhere. Undoubtedly, the backlash in Cleveland following Lebron's defection in 2010 will look like a Victorian garden party compared to the conflagration that Habs' fans will set upon their memorabilia. Any fanbase that expresses its joy and dejection through arson should be placated.